In a food processor, puree the almonds, garlic, oil, vinegar and red pepper flakes until smooth. Add the peppers, replace the top and pulse until sauce is smooth. Add salt to taste. Keep in the refrigerator for 4 to 5 days. To prepare the asparagus, wash and cut off woodsy ends. Brush with olive oil and place onto grill for about 4 minutes. Turn every minute. 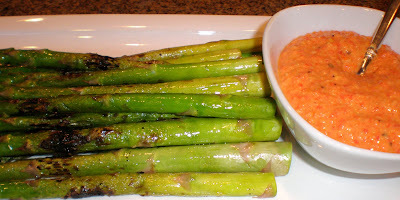 Remove and serve with the Romesco Sauce.